Saturday evening’s concert, the first of Tannery Pond’s twenty-first season, was a glorious affair, from the stunning views and perfect summer weather to the superb performances by the Amerigo Trio with guest pianist Alon Goldstein. 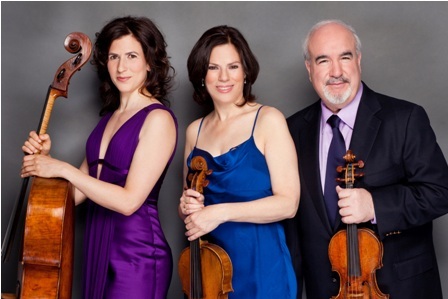 The Amerigo Trio includes violinist Glenn Dicterow, violist Karen Dreyfus, and cellist Inbal Segev; the group has been performing together since 2009. Dicterow, the concertmaster of the New York Philharmonic, is a founding member of the Lyric Piano Quartet; Dreyfus, the 1982 winner of the Naumberg Viola Competition, performs with orchestras and chamber groups worldwide and is a member of the Lyric Piano Quartet as well; and Segev has performed with leading orchestras and chamber music artists around the world. 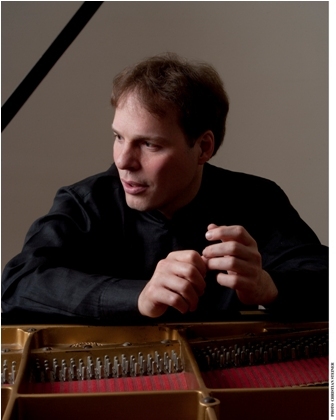 As for Goldstein, the New York Times called his performance “an irresistible powerhouse;” he performs with leading orchestras internationally. The concert began with Dicterow and Goldstein pairing for a magnificent performance of Sonata III in G minor, for violin and piano, by Claude Debussy (1862-1918), the last work the composer completed before his death. The interplay of piano and violin was a delight; the sonata is complex and evocative, and Dicterow and Goldstein brought their considerable charisma and artistry to the piece. The intimacy of the venue allows the audience not only to hear the music perfectly but to see the artists—their gestures, facial expressions, body language–as they perform. The concert venue is an 1834 Shaker building used as a tannery; it seats just over three hundred, and the historic timber-frame space boasts very good acoustics indeed. The trio next performed Serenade in C major Opus 10 by Ernst von Dohnányi (1877-1960), a lush, expansive work that showcased the three musicians beautifully. They produced a rich, warm, balanced sound, filling the room. Hearing them play together, it’s easy to understand why they formed the trio. After the intermission, the trio joined forces with Goldstein for the Piano Quartet No. 1 in G minor, Opus 25 by Johannes Brahms (1833-1897). It’s a marvelous work, big and dramatic, and it was performed with passion and energy. Goldstein is a compelling performer, his meticulous technique paired with humor and heart. Segev’s playing is fluid and bold; Dreyfus is elegant and expressive, and Dicterow is fantastic, bringing such joy to the Brahms. The Gypsy-inflected final movement was thrilling, a wild finish to a wonderful evening. The Tannery Pond Concerts take place on the Darrow School campus in New Lebanon, New York. Christian Steiner is the artistic director. For tickets or more information, call 888.820.1696 or visit www.tannerypondconcerts.org.